Prime Minister Narendra Modi on Tuesday described non-resident Indians as India’s brand ambassadors and said they were the symbols of the country’s capabilities. 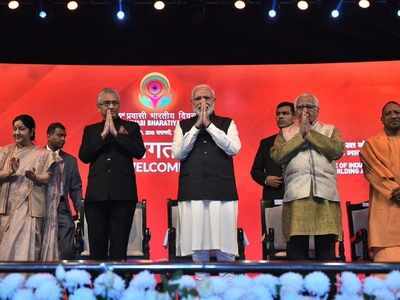 The Prime Minister was inaugurating the 15th Pravasi Bharatiya Diwas convention in his parliamentary constituency Varanasi on Tuesday. Mr. Jugnauth announced that his country will hold a Bhagwad Gita Mahotsav next month and a Bhojpuri Festival next year. For the first time, the three-day convention is being organised from January 21 to 23 instead of January 9 to allow participants to visit the Kumbh Mela in Allahabad and attend the Republic Day parade in the national capital. The theme of this year’s convention is ‘Role of Indian diaspora in building new India’.